Enterprise Holdings’ Alamo Rent A Car is introducing the new Web-based Alamo Deal Retriever on its Web site to help consumers find Alamo’s best possible deal. 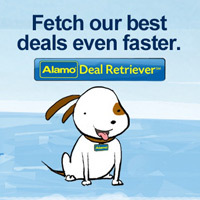 The Alamo Deal Retriever searches all valid Alamo deals and coupons on the Web to find the best Alamo rates to meet customers’ needs. The Alamo Deal Retriever was introduced with the recent re-launch of the company's website, and is being publicized through the TV ads and social media. It is the car rental company’s first national TV ad campaign since 2009. Fleishman-Hillard handled traditional media outreach, while digital agency 360i is working on the word-of-mouth campaign. This campaign targets the head of household who is in charge of planning the family trip and is often doing so on a budget, said Meghan Maguire, Alamo brand publicity manager. “We want them to know that they can visit our newly relaunched Alamo.com and use the Alamo Deal Retriever to find a great car rental deal to meet the needs of their next vacation,” Maguire tells Marketing Daily. The campaign represents an investment in reaching a broader audience and raising awareness with consumers planning their next vacation, she said. “We want to remind families that Alamo is a great brand with great deals,” Maguire said. The campaign also includes a word-of-mouth effort aimed at increasing brand conversation, driving traffic to Alamo.com, and reinforcing the message about the Deal Retriever, she says. The brand is also partnering with influencers on Pinterest in a contest called “Pin Your Happy Place.” Influencers will pin a piece of Alamo-branded content and other vacation-themed images to their boards and then encourage their followers to do the same. “Our target audience is definitely active on Pinterest, so by encouraging them to imagine their next vacation we hope to solidify their connection to Alamo as the car rental brand for vacationers,” Maguire said.